They can, but only because you have another wire that may not be well grounded. But ... how did you check the battery and alternater under load ?? How do you tell the capacity of the batt is still ok ? baffles also, kind of a pseudo fuel cell. I think AAM made a larger capacity oil pan without baffles but I'm not sure. No..stick with the OEM tank unless you do a full and proper fuel cell. And you say that for what reason ???? I'm not sure if it qualifies as a baffle, but you can look at the pics on my web page below and see that there is a wide horizontal "lip" or "ledge" that will limit oil splashing up the sides during cornering and acceleration. I don't know if this will keep sufficient oil near the pickup screen during hard cornering or not (the widest part of the lip is front and back, not side and side). I am not aware of readily available custom oil pans for our (AWD) engines. Most racing orgs will accept an un-touched OEM tank in a race car OR a properly installed-proper type-properly maintained..fuel cell. The trick about the cells is doing it all correctly, when i was wondering about a cell for the 7 last year most people told me they wish they never installed the cell and left the OEM tank, and that was a pretty common answer across a wide range of race classes. Is anyone familiar with the Richard Petty driving experience? Chicago area and I never heard of it before. Yes. A little. 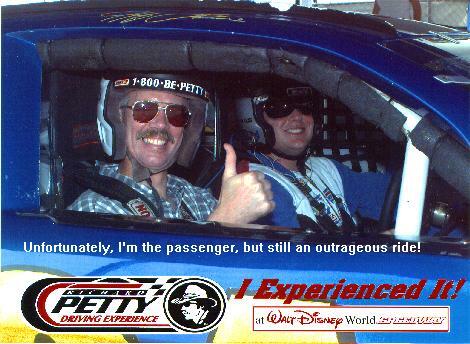 Below is a pic of me in one of their "Experience" cars next to Walt Disney World in Orlando, Florida. A person could also drive one of Petty's cars (something over $100), but speeds were limited to only about 120 mph and the drive around the track had to be orderly and no passing of the Petty driver's lead car. Not sure how many laps. Neither of these were "driver training". I would guess they have a web site you could consult (search with google.com). There is also 1-800-BE-PETTY. doing that, you might as well put in a sump with doors to act as baffles. While it won't be a 'fuel cell' it would have some advantages over the stock configuration. Has anyone had or know anything about the brands Hankook or Maxxis? Also would I run into problems mounting an H rated tire on my 92 RT TT??? I remember someone said that some places might not mount them but other than that is there much of a safety factor involved??? My car is a daily driver with the occasional trip to the drag strip. I rarely exceed 100 mph. 1) Left front lower arm bent, bushing and control need to be replaced. I was told that you had to purchase / replace the bushing AND the control together so that's $344*2 = $688 dollars + $420 labor = $1108 I was told that the caster is at 6.3 and that caster on our cars is not adjustable. He also said that the bushing is pulling in and out of the arm. 3) subframe IS possibly bent. How the heck did this happen? Would a pothole do this? Would I notice something if someone at the last shop I took it to did something (ie physical damage). Or maybe its from running some of those hills in SF, although I've never bottomed out. Can anyone knowledgeable in this area give me a heads up on what this all means? He said that excessive tire wear could be caused by the bushing pulling in and out. Is this even something I could try myself with some jacks? A pothole wont do that type of damge without first shredding and busting the wheel. Did the last owner nail something and get it fixed? I've had the car since 14k miles (past 3 years, its at 56k now). Since my last alignment with Custom, I've hit a few potholes but nothing that drastic. No one's been driving the car except me (and when its in the shop...which it was for for the past month, but like I said I didnt notice anything crazy...). "Is this even something I could try myself with some jacks?" Hey everybody, this is my first time posting, and I do not have much experience working with cars, especially a 3000. Anyway, here's my question. I've noticed lately that when I push the cflutch in to shift gears, usually when I'm going around a turn and downshifting and have the clutch in for a little bit, but sometimes when I just pull the car out of gear coming up on a stoplight, that my RPMs sometimes fall much past the 700 idle, most of the time down to about 400. The engine stays down at 400 for about a secfond befcore it comes back up on its own, or if I step on the gas a bit, that will obviously help. And its happened 3 times now where the engine speed falls all the way down and the engine stalls. But when it does that, ther's no shaking like as if I just let out the cflutch without giving it enough gas. and when it's done it, 2 of 3 times I have been going around a turn, and lost all power everything while in the turn. Any help would be greatly appreciated. Also, I have a problem with my drivers side door, when it's opened from the outside, everything is fine all the time, but when I open the door from the inside, most of the time the car doesn't know that the door is open. The dome light wont come on, the door ajar light on the dash doesn't come on, and I cant set the alarm. Ifc anyone has any ideas as to what this may be caused by, I'd appreciate it. >1) Left front lower arm bent, bushing and control need to be replaced. I suspect that these parts are much cheaper at Mitsu Parts Direct or Tall Mitsu. Just a guess, but I'd say $500 or less for both lower control arms. They probably come with new bushings (check to be sure). And, hey: You get new lower ball joints with the arm, too! What a deal! Ball joints can go at 100,000 miles, so think of all this as preventive maintenance. Labor of $420? Wow!!! Do you get kissed, too, or just screwed? If *I* can take out a lower control arm laying on the garage floor with my car up on jack stands, how hard can it be for a shop with a lift and the proper tools? A couple of hours labor, tops. An hour a side, maybe: You whack it with a pickle fork to separate the ball joint, unbolt the tie rod, unbolt the strut, unbolt and wiggle out the big center mounting bolt, and the mutha comes right out of there. There are probably step by step instructions around here somewhere. Find another shop. It is not brain surgery. Anybody can do this one for a couple of hours labor. .
Time for a strut replacement soon. >running some of those hills in SF, although I've never bottomed out. Have you owned the car since it was new? If not, maybe it was hit. If the lower control arm and the subframe are bent, it sounds like a hit to me. Maybe a collision repair shop can tell you about the subframe. $180 for an alignment? Do you get kissed for that one too? $100 is more like it. $1345? Nah. Half that at a different shop. >>1) Left front lower arm bent, bushing and control need to be replaced. I cannot believe the outrageous prices you people on the left coast pay for your work. I am going to propose to the Stealth Boys here in Cedar Rapids that we rent a garage, hire Mike the Mechanic full time, and go into business. We'll pay a car transporter to make the round trip every week from here to LA and San Francisco. He'll bring us 8 cars from the left coast, and take 8 cars back. We'll take cars like Mike Baldwin's bent beast, do enough work to make it worthwhile it to all concerned (on Mike's car, for example, maybe we'll also do a 60K service for $750, including the water pump), and keep a steady flow of cars going back and forth. We'll make a profit and you left coasters will get your cars fixed, updated, and modified for a fraction of what the thieves in California are charging. Would that we could actually do something like that. Dream on. If we were just a little bit closer to California, it might work. Hmmm... do people in Chicago get screwed, too? That's a LOT closer. $100? That's IF you want to drive to Cedar Rapids. $140 or so is the going price here in SF from *average* shops, $100-120 from crappy ones. Custom Alignment is rated as one of the Top Ten alignment shops in the _entire country_ for 5 or 6 years running. $180 for an alignment from them is as perfect as it can get, and worth it at twice the price. Your car will never feel so "true" to the road afterwards. Driving the Stealth or the VR-4 out of there always feels like someone took off a parking brake that I didn't know about - they are that good. Have Willy install, and have him do a basic alignment to get you on the road, but then take it to Custom Alignment for the real deal. They are absolutely the best - and since Geoff turned me on to them 3 years ago, I won't go anywhere else. (And I can't afford them either - but I'll pay for the best!). I usually pay $240 there, since I get an high-speed balancing of the wheels too. They balance them perfectly in 3 planes to within 1/10 ounce. I've never been in another shop that's even close to *that good*. We have the Golden Gate Bridge, San Francisco Bay, Alcatraz... You have cows or something. I'll pay the money gladly. LOL! Subject: RE: Team3S: Pistons and pads update: 328-355mm StopTech Brake Kit s! There is a guy on 3si who came out with a bracket that makes the NA to TT brake conversion easier, without switching out tie rod ends, hubs, all the rest of the mess. He made a simple bracket that holds the caliper in the proper position without all that switching around. Have you or anyone else ever heard of these? I know I refuse to purchase anything brake related that hasn't been extensively tested. Heres the website. Its under 2GTT Conversion I believe. Heres a link to his recent post. There are quite a few that he responded to, but this happens to be the one that I am part of. 92 Stealth SOHC -- One day soon hope to be doing the TT brake upgrade. Eeek. Ment to send that out with a different subject line. Sorry guys. I cant believe you dont belive it. If I did the same work in iowa that I did here, Id have to take a 60% paycut too. Weve been over this, its geographical.